The video above shows Savannah standing through numerous exercises designed to help support her nervousness about a rider attempting to mount. 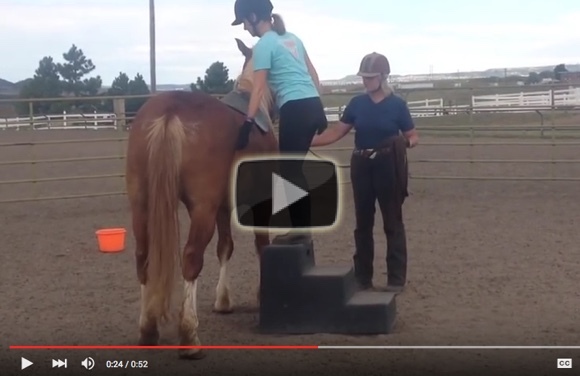 Watch as our rider ascends the mounting block, touching and teaching Savannah that she’s ok through this process. When she leaves the block, pay attention to how she rewards and praises Savannah and practices gratitude keeping her energy light. All these elements help Savannah to stay relaxed and calm during the exercises all in an effort to support her acceptance and quell any fears. This is repeated numerous times on this day, and again as a part of other visits with Savannah until she’s calm, relaxed and free from fear.